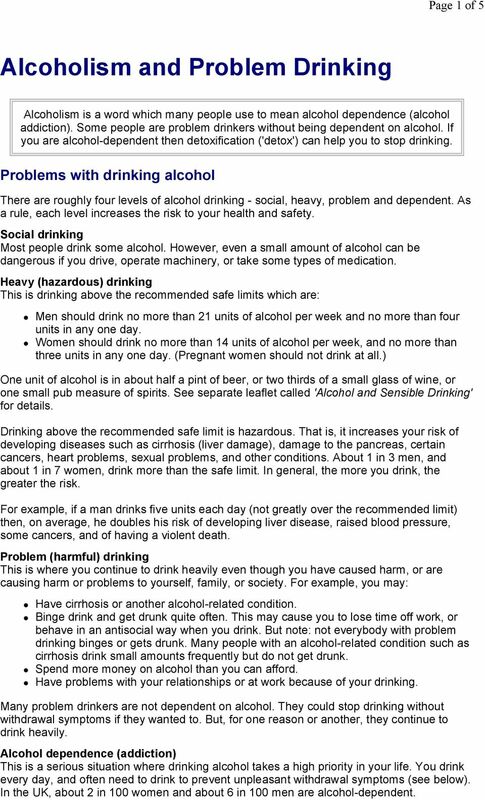 Download "Alcoholism and Problem Drinking"
1 Page 1 of 5 Alcoholism and Problem Drinking Alcoholism is a word which many people use to mean alcohol dependence (alcohol addiction). Some people are problem drinkers without being dependent on alcohol. 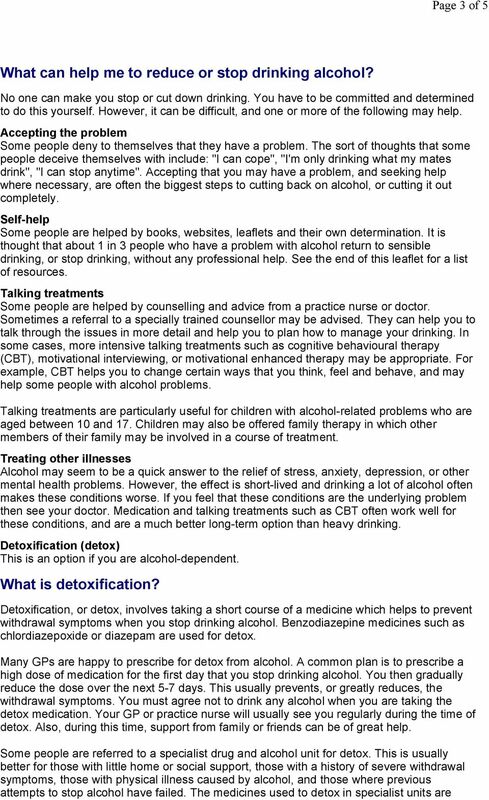 If you are alcohol-dependent then detoxification ('detox') can help you to stop drinking. Problems with drinking alcohol There are roughly four levels of alcohol drinking - social, heavy, problem and dependent. As a rule, each level increases the risk to your health and safety. Social drinking Most people drink some alcohol. However, even a small amount of alcohol can be dangerous if you drive, operate machinery, or take some types of medication. Heavy (hazardous) drinking This is drinking above the recommended safe limits which are: Men should drink no more than 21 units of alcohol per week and no more than four units in any one day. Women should drink no more than 14 units of alcohol per week, and no more than three units in any one day. (Pregnant women should not drink at all.) One unit of alcohol is in about half a pint of beer, or two thirds of a small glass of wine, or one small pub measure of spirits. 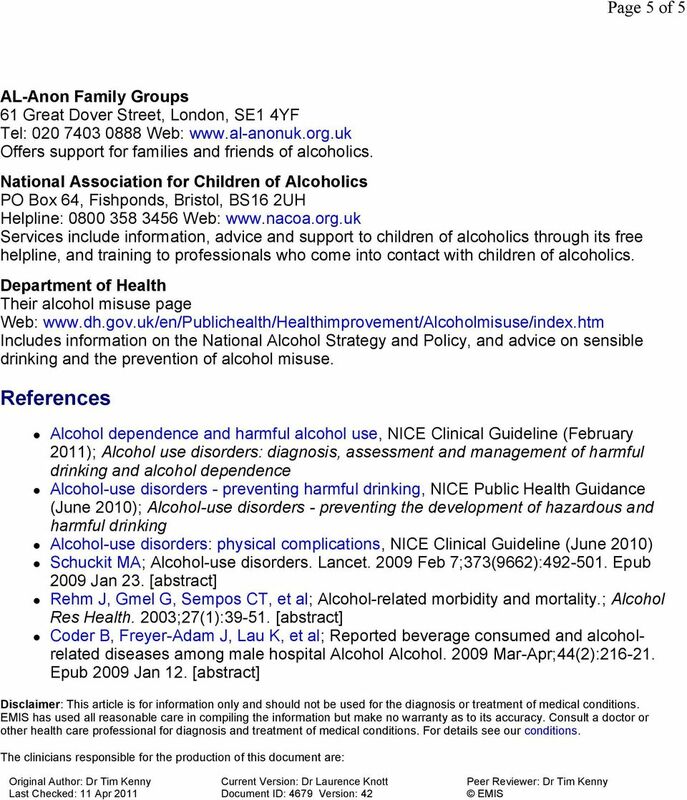 See separate leaflet called 'Alcohol and Sensible Drinking' for details. Drinking above the recommended safe limit is hazardous. That is, it increases your risk of developing diseases such as cirrhosis (liver damage), damage to the pancreas, certain cancers, heart problems, sexual problems, and other conditions. About 1 in 3 men, and about 1 in 7 women, drink more than the safe limit. In general, the more you drink, the greater the risk. For example, if a man drinks five units each day (not greatly over the recommended limit) then, on average, he doubles his risk of developing liver disease, raised blood pressure, some cancers, and of having a violent death. Problem (harmful) drinking This is where you continue to drink heavily even though you have caused harm, or are causing harm or problems to yourself, family, or society. For example, you may: Have cirrhosis or another alcohol-related condition. Binge drink and get drunk quite often. This may cause you to lose time off work, or behave in an antisocial way when you drink. But note: not everybody with problem drinking binges or gets drunk. Many people with an alcohol-related condition such as cirrhosis drink small amounts frequently but do not get drunk. Spend more money on alcohol than you can afford. Have problems with your relationships or at work because of your drinking. Many problem drinkers are not dependent on alcohol. They could stop drinking without withdrawal symptoms if they wanted to. But, for one reason or another, they continue to drink heavily. Alcohol dependence (addiction) This is a serious situation where drinking alcohol takes a high priority in your life. You drink every day, and often need to drink to prevent unpleasant withdrawal symptoms (see below). In the UK, about 2 in 100 women and about 6 in 100 men are alcohol-dependent. 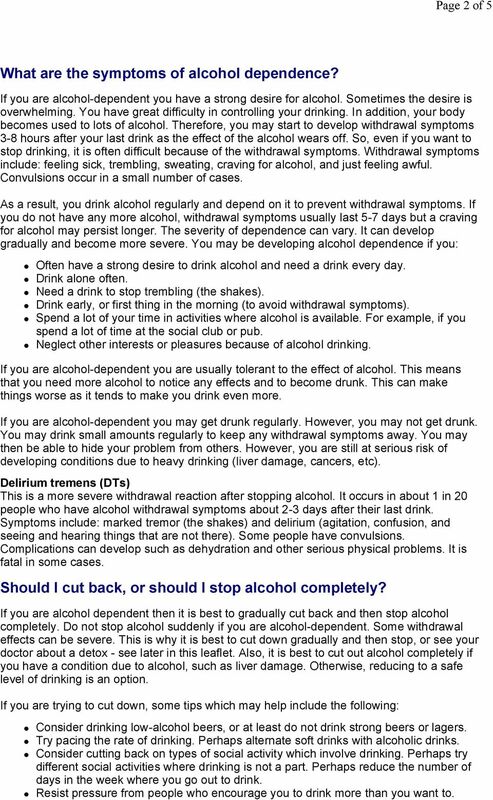 2 Page 2 of 5 What are the symptoms of alcohol dependence? If you are alcohol-dependent you have a strong desire for alcohol. Sometimes the desire is overwhelming. You have great difficulty in controlling your drinking. In addition, your body becomes used to lots of alcohol. Therefore, you may start to develop withdrawal symptoms 3-8 hours after your last drink as the effect of the alcohol wears off. So, even if you want to stop drinking, it is often difficult because of the withdrawal symptoms. Withdrawal symptoms include: feeling sick, trembling, sweating, craving for alcohol, and just feeling awful. Convulsions occur in a small number of cases. As a result, you drink alcohol regularly and depend on it to prevent withdrawal symptoms. If you do not have any more alcohol, withdrawal symptoms usually last 5-7 days but a craving for alcohol may persist longer. The severity of dependence can vary. It can develop gradually and become more severe. You may be developing alcohol dependence if you: Often have a strong desire to drink alcohol and need a drink every day. Drink alone often. Need a drink to stop trembling (the shakes). Drink early, or first thing in the morning (to avoid withdrawal symptoms). Spend a lot of your time in activities where alcohol is available. For example, if you spend a lot of time at the social club or pub. Neglect other interests or pleasures because of alcohol drinking. If you are alcohol-dependent you are usually tolerant to the effect of alcohol. This means that you need more alcohol to notice any effects and to become drunk. This can make things worse as it tends to make you drink even more. If you are alcohol-dependent you may get drunk regularly. However, you may not get drunk. You may drink small amounts regularly to keep any withdrawal symptoms away. You may then be able to hide your problem from others. However, you are still at serious risk of developing conditions due to heavy drinking (liver damage, cancers, etc). Delirium tremens (DTs) This is a more severe withdrawal reaction after stopping alcohol. It occurs in about 1 in 20 people who have alcohol withdrawal symptoms about 2-3 days after their last drink. Symptoms include: marked tremor (the shakes) and delirium (agitation, confusion, and seeing and hearing things that are not there). Some people have convulsions. Complications can develop such as dehydration and other serious physical problems. It is fatal in some cases. Should I cut back, or should I stop alcohol completely? If you are alcohol dependent then it is best to gradually cut back and then stop alcohol completely. Do not stop alcohol suddenly if you are alcohol-dependent. Some withdrawal effects can be severe. This is why it is best to cut down gradually and then stop, or see your doctor about a detox - see later in this leaflet. Also, it is best to cut out alcohol completely if you have a condition due to alcohol, such as liver damage. Otherwise, reducing to a safe level of drinking is an option. If you are trying to cut down, some tips which may help include the following: Consider drinking low-alcohol beers, or at least do not drink strong beers or lagers. Try pacing the rate of drinking. Perhaps alternate soft drinks with alcoholic drinks. Consider cutting back on types of social activity which involve drinking. Perhaps try different social activities where drinking is not a part. Perhaps reduce the number of days in the week where you go out to drink. Resist pressure from people who encourage you to drink more than you want to. 4 Page 4 of 5 much the same as GPs prescribe, apart from clomethiazole which should only be used in hospitals. Hospital units have more staff and expertise for giving support and counselling than GPs have. People with serious alcohol-related problems may be better off being admitted to hospital for detox. The medication does not make you stop drinking. You need determination to stop. The medication simply helps you to feel better whilst your body readjusts to not having alcohol. Even after the period of detox you may still have some craving for alcohol. So you will still need willpower and coping strategies for when you feel tempted to drink. 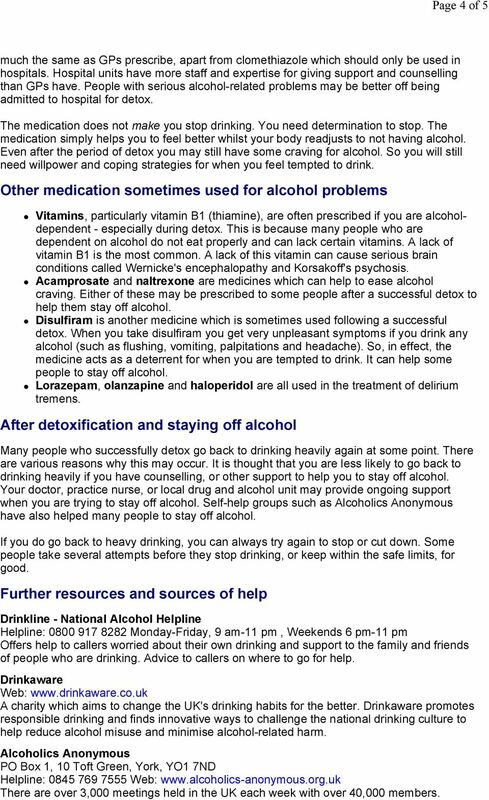 Other medication sometimes used for alcohol problems Vitamins, particularly vitamin B1 (thiamine), are often prescribed if you are alcoholdependent - especially during detox. This is because many people who are dependent on alcohol do not eat properly and can lack certain vitamins. A lack of vitamin B1 is the most common. A lack of this vitamin can cause serious brain conditions called Wernicke's encephalopathy and Korsakoff's psychosis. Acamprosate and naltrexone are medicines which can help to ease alcohol craving. Either of these may be prescribed to some people after a successful detox to help them stay off alcohol. Disulfiram is another medicine which is sometimes used following a successful detox. When you take disulfiram you get very unpleasant symptoms if you drink any alcohol (such as flushing, vomiting, palpitations and headache). So, in effect, the medicine acts as a deterrent for when you are tempted to drink. It can help some people to stay off alcohol. Lorazepam, olanzapine and haloperidol are all used in the treatment of delirium tremens. After detoxification and staying off alcohol Many people who successfully detox go back to drinking heavily again at some point. There are various reasons why this may occur. It is thought that you are less likely to go back to drinking heavily if you have counselling, or other support to help you to stay off alcohol. Your doctor, practice nurse, or local drug and alcohol unit may provide ongoing support when you are trying to stay off alcohol. Self-help groups such as Alcoholics Anonymous have also helped many people to stay off alcohol. If you do go back to heavy drinking, you can always try again to stop or cut down. Some people take several attempts before they stop drinking, or keep within the safe limits, for good. Further resources and sources of help Drinkline - National Alcohol Helpline Helpline: Monday-Friday, 9 am-11 pm, Weekends 6 pm-11 pm Offers help to callers worried about their own drinking and support to the family and friends of people who are drinking. Advice to callers on where to go for help. Drinkaware Web: A charity which aims to change the UK's drinking habits for the better. Drinkaware promotes responsible drinking and finds innovative ways to challenge the national drinking culture to help reduce alcohol misuse and minimise alcohol-related harm. Alcoholics Anonymous PO Box 1, 10 Toft Green, York, YO1 7ND Helpline: Web: There are over 3,000 meetings held in the UK each week with over 40,000 members. Factsheet. Alcohol-Related Brain Damage (ARBD) What Is It? The different forms of ARBD. What is ARBD? Factsheet What is ARBD? Alcohol-related brain damage (ARBD), or alcoholrelated brain injury (ARBI), is an umbrella term for the damage that can happen to the brain as a result of long-term heavy drinking. Alcoholism. Alcoholism is a type of drug addiction. There is both physical and mental dependence on alcohol. What is alcohol-related brain damage? Version 2 This guideline describes how to manage patients who are showing signs and symptoms of alcohol withdrawal and Wernicke s Encephalopathy.